Turkey cutlets—also known as paillards—are pounded or thinly sliced cuts of turkey breast. The fact that the thin pieces of meat cook quickly is one of the biggest advantages. Plus, turkey breast is lean, and it's an excellent alternative to veal, pork, or chicken cutlets. 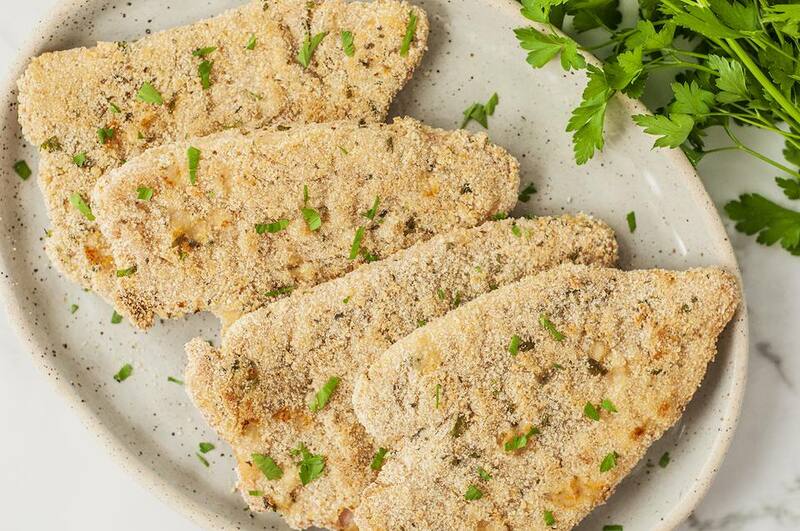 These baked turkey cutlets are lean and flavorful with a simple Parmesan cheese and breadcrumb coating. A small amount of spicy mustard in the egg coating adds extra flavor to the turkey cutlets. The simple breaded cutlets make a tasty dish with baked potatoes and a side vegetable, or slice them and serve on a Caesar salad. Or arrange the cooked cutlets in a baking dish with marinara sauce and shredded mozzarella cheese and bake just until the cheese has melted. A lemon sauce would be excellent on the cutlets as well. Gather the ingredients. Preheat oven to 375 F.
Grease a jelly-roll pan or a 9x13x2-inch baking pan. Using the flat side of a meat mallet or rolling pin, gently pound cutlets between sheets of plastic wrap to thin slightly. Lightly sprinkle both sides of the cutlets with salt and pepper. Put the flour in a wide, shallow bowl and set aside. In a food processor or chopper, pulse the bread crumbs, Parmesan cheese, parsley, and basil together until the crumbs are fine. Pour the bread crumb mixture into a pie plate or shallow bowl. In another bowl, whisk together the mustard and eggs. Dip cutlets in the flour to coat, followed by the egg mixture. Then, coat them with the bread crumb mixture. Bake the cutlets for 20 to 25 minutes, depending on thickness, or until turkey is no longer pink inside. The minimum safe temperature for poultry is 165 F. If in doubt, check them with an instant-read thermometer. The turkey cutlets can be breaded, frozen, and baked on another day. Just bread the cutlets and arrange them on a baking sheet lined with parchment paper or waxed paper. Place the baking sheet in the freezer. When the breaded cutlets are frozen solid, transfer them to a freezer bag or place them in a container, separated by sheets of parchment paper or waxed paper. To bake the cutlets, heat the oven to 375 F. Arrange the frozen breaded cutlets on a baking sheet and bake for 25 to 30 minutes, or until they're cooked through.